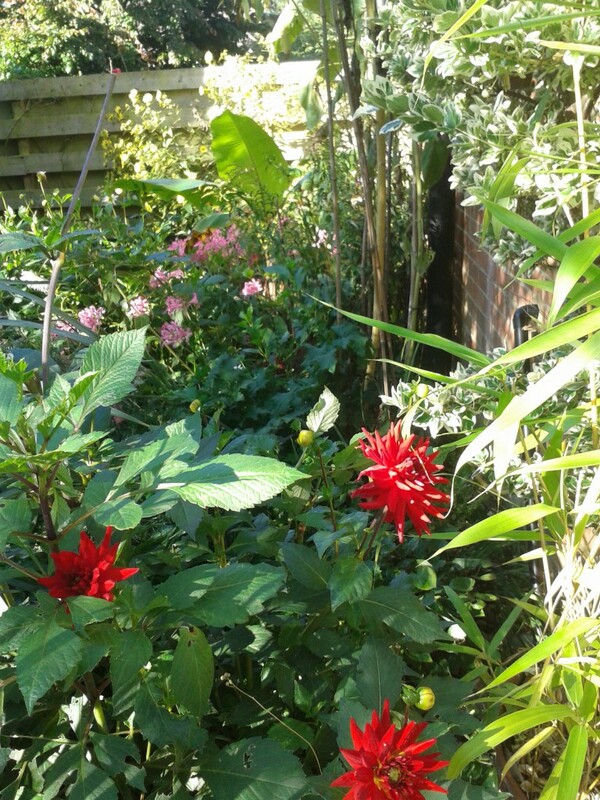 Earlier this year I planted out a secluded south facing bed with a hot and tropical feel, hot bed, hot colours. 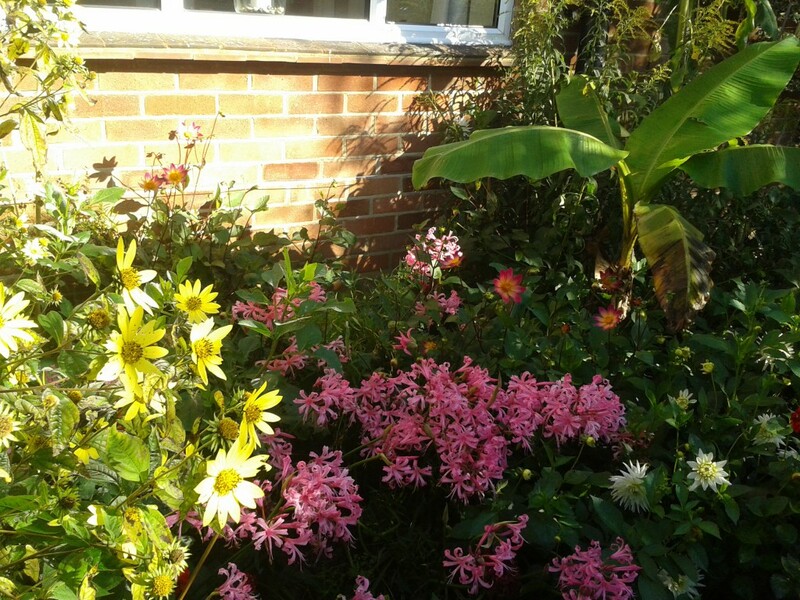 This tropical feel garden, with hot colours for cut flowers catches the sun all day and would be in view from our main outdoor summer seating area . This area is currently occupied by lots of Nerines, so flowers for the late summer were already ahead. A Musa Basjoo Banana (£5 from a nursery at J1 on the M40) was key to the tropical feel. It just oozes tropics. Anchoring the bed at either end are Helianthus Lemon Queen and Romneya, the California Poppy Tree. Filling in the spaces I used Zinnias grown from seed, Oesteospurmums from cuttings, and lots of bright Dahlias. The objective of providing cut flowers from this bed would be bolstered by my first attempt at growing Alstromeria, the peruvian lilly. These are included as I read that they stay fresh in a vase for 3 weeks. I bought them mail order, and about half of them grew. Not ideal, but enough growing strongly to make up for losses. Some Agapanthus I had been given are dotted in, with a view to them establishing to flower in forthcoming years. So all planted and promises of hot coloured cut flowers all summer. This bed also happens to be overlooked from my hallway, so is what we see coming downstairs in the morning. And what any visitors see when entering the house. It started slowly, and I thought the dry summer would wipe out much if it. Not only did it survive, but it has thrived. The area is now our first call for cut flowers. They have been abundant from June and still plentiful going into October. 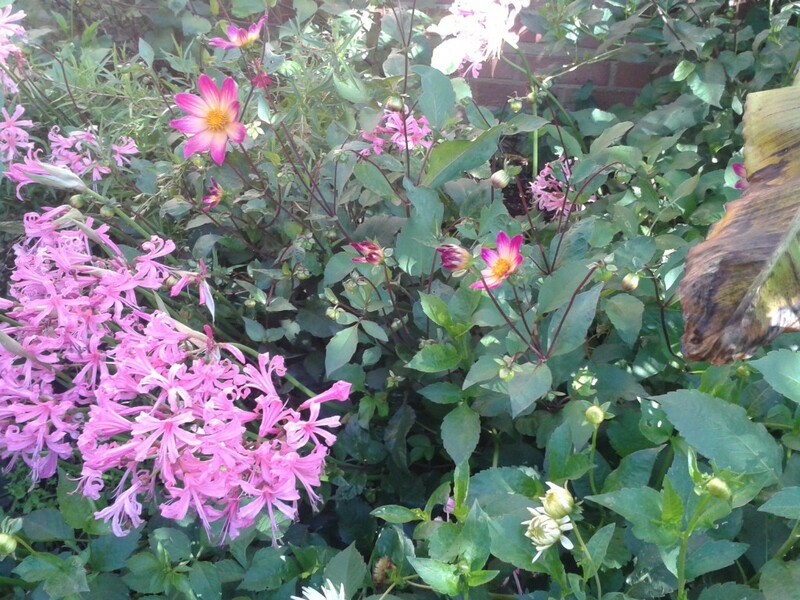 I was caught out by the late season exuberance, and found many plants were not adequately supported. This meant they leaned forward into the grass path, and left the back of the bed looking open. As the season went on bigger plants leaned in too far. Nerines came out early this year, in the past they’ve not shown until late October. Some thought into what plants go where, and some discrete canes, should solve that for next year. And some planning to get through the dry weather. I will add further loads of compost. And install a leaky pipe irrigation system there, to make sure the water gets right down below the foliage and into the roots. And the proof of the pudding? You can see that it is still bringing spectacular colour, especially for a cheap and fast go at a hot bed, hot colours idea. 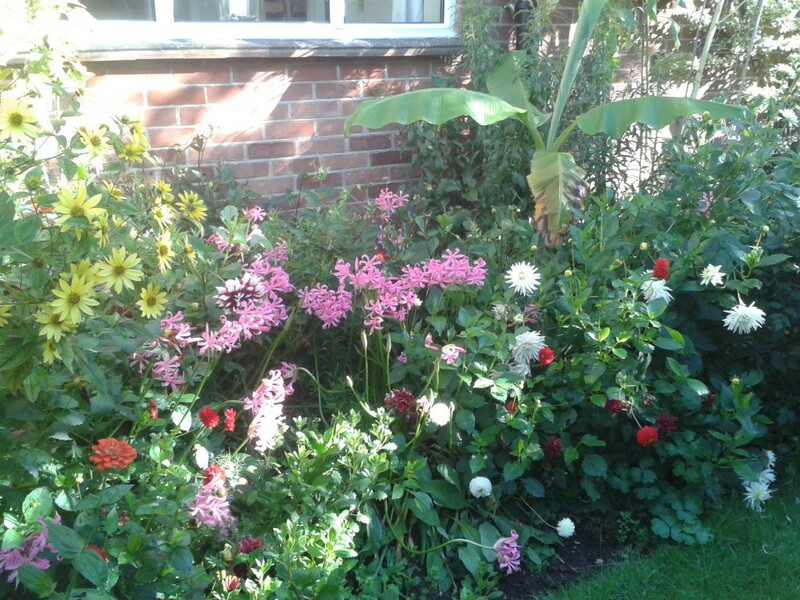 And especially compared to the perennials borders that lose colour fast from October. And the great thing is that it will only get better. I love it! Not so much planning a flower bed, but I have had a plan to rework and revitalise a flower bed for 9 months now. 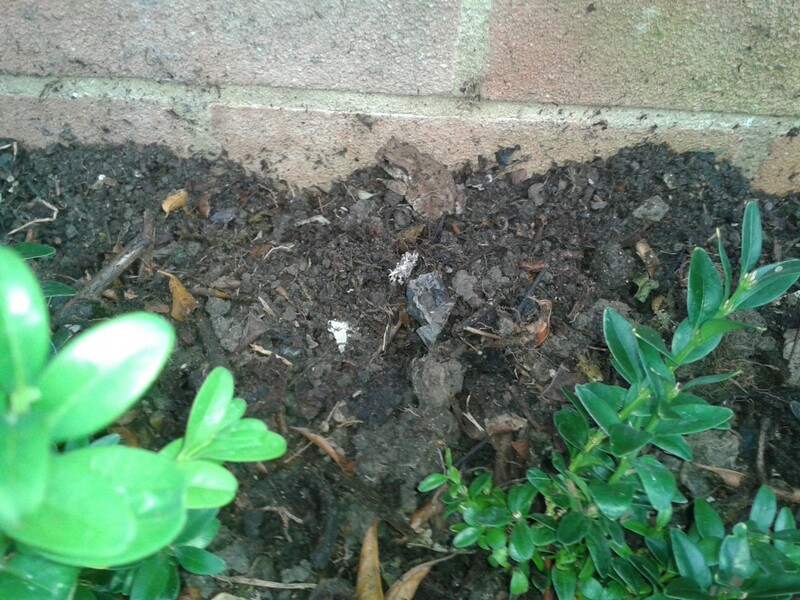 But I could not recall what was growing in there, and was loath to just dig it out and discard anything. So I waited to see what all seasons provided and find out for sure what grows there. In that time I have grown some Iris and Sedum that I knew would thrive there, and about 40 Buxus plants to use as a backdrop and border. So the time has been useful and saved me about £60 in new plants. I also used the project as a cost exercise, timing how long each aspect took. Clearing out existing plants took two hours, involving the lifting of huge blocks of Crocosmia, and an invasive ground cover Campanula. 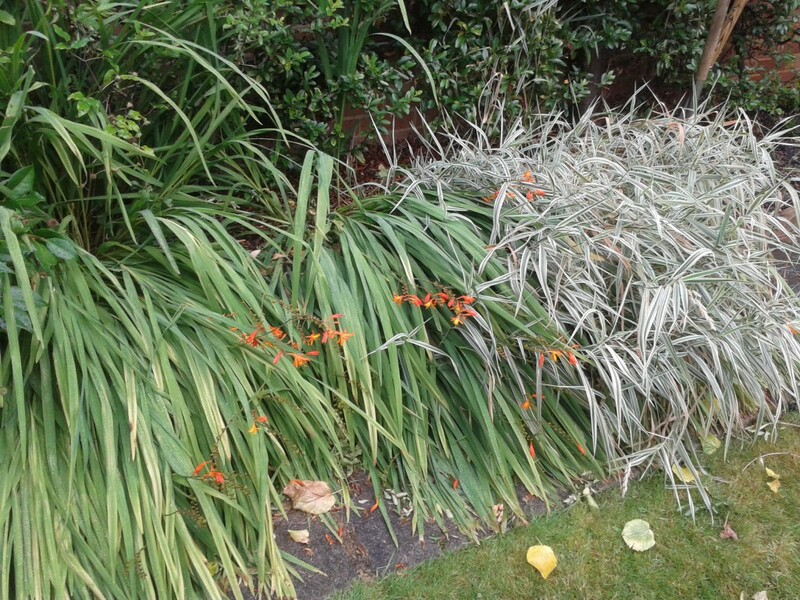 The area is overshadowed by a large Pyracantha, which has both sheltered the ground from rain and deposited a deep mulch of dead leaves, making sure no water penetrated. A small toad emerges during the disturbance. I do everything I can to encourage these slug and snail eaters. Then digging it over, deep enough to crack the “pan” that has formed about 8 inches down, and adding 200 litres of compost, 3 wheelbarrows full from the compost heap, took another hour. Digging it in so it was well distributed consumed another hour. It was then ready for new plants. The Buxus where laid out in two tiers, one that will eventually grow higher than the other. And the other plants dependent on where the sun would strike most in the afternoon. Planting box in straight lines and evenly spaced is essential. If you have concerms about box blight, a reasonable alternative to Buxus for such framework is euonymus microphyllus, I saw it used in some national trust gardens recently. 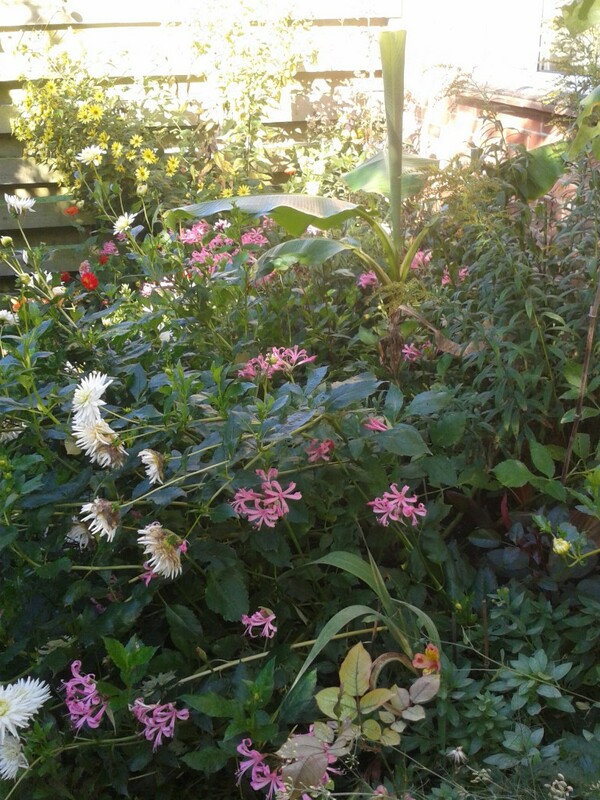 My plan calls for a small space in front of them for the Iris and Sedum, Digitalis and Lysimachia firecracker. There was also some Convallaria that was salvaged to add back in. Finally I added about 10 Echinacea plants that I have grown from seed. Six hours in, revitalising a flower bed is not as easy as it might seem. Draw up plans to show what is growing, what you want to keep and what will be discarded. Consider when is best for you to do it. Allow for weather and how much compost you can generate from your heap. And also plan to have plants ready to fill the empty space. If you need a flower bed replanted or revitalised, call us for a quote. Or email us here.